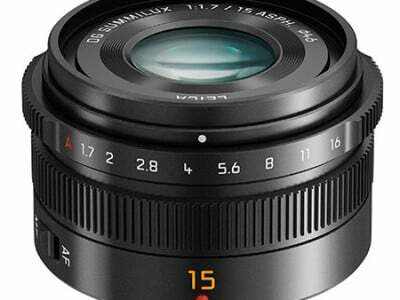 The Leica Summilux 15mm f1.7 is a semi-wide lens designed for the Micro Four Thirds system. Mounted on a Panasonic or Olympus body, it delivers equivalent coverage of 30mm, making it a mild wide-angle roughly between the traditional 28 and 35mm focal lengths. 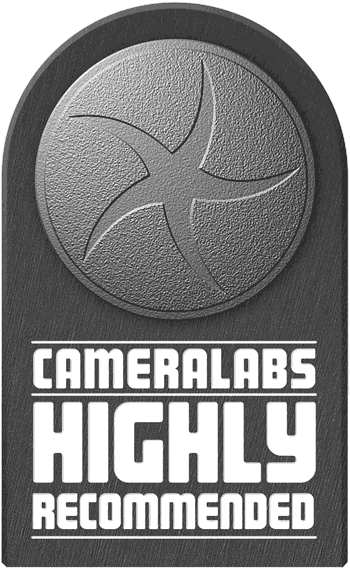 This makes it ideal as a general-purpose option, offering a step-up over kit zooms. The Leica 15mm may be designed as a premium prime lens that works on any Micro Four Thirds camera, but Panasonic has been careful to ensure the barrel is a perfect match for the tiny GM1. So unlike most lenses, the 15mm f1.7’s barrel doesn’t protrude below the base of the camera, allowing unobstructed mounting on tripods. There’s also a physical aperture ring, although this only works on Panasonic bodies; mount it on an Olympus body and you’ll be using the body’s controls to adjust the aperture, just like the earlier Nocticron. Announced in March 2014, the Summilux 15mm f1.7 becomes the fourth Micro Four Thirds lens designed and manufactured as a joint effort between Leica and Panasonic. Like the 42.5mm Nocticron, 45mm f2.8 macro and 25mm f1.4 standard primes before it, the 15mm f1.7 is designed and certified by Leica in Germany, and manufactured by Panasonic in Japan. As such it may not be ‘pure’ Leica, but the optical and build quality is of a very high standard. The big question for Micro Four Thirds owners though is how it compares to the slightly cheaper, slightly longer but fractionally slower Olympus 17mm f1.8 – read-on to find out! The Leica 15mm is designed for Micro Four Thirds bodies which apply a two-times field-reduction factor – that means they deliver coverage that’s equivalent to a full-frame lens that’s two times longer. 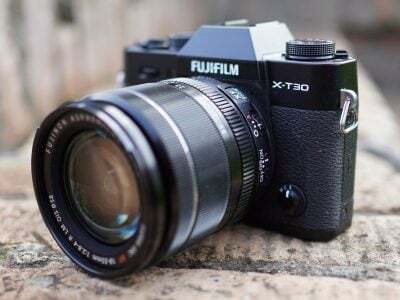 So a 15mm focal length becomes equivalent to 30mm, delivering a semi-wide field of view, a fraction tighter than 28mm, but a tad wider than 35mm. This makes it an ideal general-purpose lens, especially if you shoot more landscapes, buildings and group shots than individual portraits. I tested it against the Olympus 17mm f1.8, which delivers a 34mm equivalent field of view for a slightly tighter composition. You can see how their coverage compares below. The second most important optical specification on a lens is the maximum aperture: f1.7 on the Leica and f1.8 on the Olympus. Often manufacturer specifications can vary a little in real life, but I can confirm that when the Leica 15mm was closed to f1.8, it matched the exposures delivered by the Olympus at f1.8. Meanwhile opening the Leica to f1.7 allowed it to gather one third of a stop extra light in practice, meaning shutter speeds one third of a stop faster or sensitivities one third of a stop slower. Again this is not theoretical; I measured it in real-life situations. While the Leica is a bit wider and a bit brighter than the Olympus, I think the more important differences are their relative sharpness, aberrations and rendering. I’ll compare these in the results pages, but for now show you a typical image shot with the Leica 15mm at its maximum aperture and minimum focusing distance. I took this with the 15mm mounted on the Olympus OMD EM1. The Leica and Olympus share roughly similar optical designs and specifications: the Leica 15mm has nine elements in seven groups compared to nine elements in six groups on the Olympus. The Leica has three aspherical elements compared to two on the Olympus. Both have seven-blade aperture systems, and again I’ll be taking a closer look at how they render out-of-focus elements in my results pages. The Leica focuses closer at 20cm compared to 25cm on the Olympus, but the latter’s slightly longer focal length means they end up delivering similar maximum magnifications: 0.1x on the Leica and 0.08x on the Olympus. 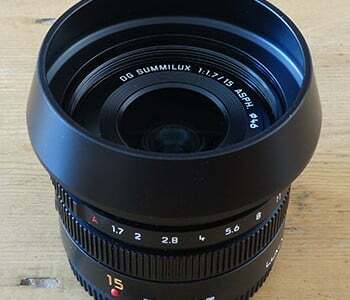 For completeness, the Lumix 14mm f2.5 pancake has seven aperture blades, a closest focusing distance of 18cm, a 46mm filter thread, and measures 55.5mm in diameter and 21mm in length. There’s no optical stabilization in any of these lenses, although if you mount them on a Lumix GX7 or any Olympus body, they’ll become stabilized by the camera’s sensor-shift capabilities. I can confirm this works with the Leica 15mm f1.7 on an Olympus OMD EM1, and composing with a stabilized view was certainly much easier for me than on an unstabilised body. The Leica 15mm measures 57.5mm in diameter, 36mm in length and weighs 115g. This makes it almost identical to the Olympus 17mm which shares the same diameter, is only half a mm shorter and 5g heavier. Indeed looking at the physical specifications you’d think there’d be nothing to choose between them, but these numbers don’t tell you everything you need to know. Their maximum diameters may be the same, but occur at different points on the barrel. On the Olympus, the widest part is closest to the lens mount, after which the barrel gradually narrows in several steps. Meanwhile the Leica is roughly the same diameter all the way along the barrel, but widens at the manual aperture ring towards the front end. Their respective designs make the Olympus 17mm appear smaller – even though it isn’t – but there’s an important impact for Lumix GM1 owners. The Olympus 17mm lens barrel protrudes by a mm or so below the GM1’s lens mount and body base. This means if you have the combination mounted on a tripod with a plate which extends much more than about 1cm from the thread, the Olympus lens barrel will block it. The Leica 15mm has however been designed with the GM1 in mind, and while its maximum diameter still protrudes below the body a fraction, it doesn’t do so until about 4cm away from the center of the tripod thread, allowing it to accommodate all but the largest plates. To be fair, there’s only two lenses available at the time of writing which are flush with the bottom of the GM1 body: the 12-32mm kit zoom, and now the Leica 15mm. It’s also something which won’t affect any other body in the system, as both lenses are some of the smallest in the catalogue. But if you do own a GM1 and are choosing between the Leica 15mm and Olympus 17mm, the fact you’ll be able to mount the former on a tripod could be a deciding factor – it would be for me. Moving on, their build quality feels similar: both are light but solid lenses, although neither features any kind of weather sealing. Both share 46mm filter threads and come supplied with lens caps. There’s no hood supplied with the Olympus, but Leica includes a classy metal hood that may be short, but is very effective in use. It mounts with a bayonet action, although you’ll first need to twist-off a ring from the front of the barrel. The hood also employs its own rubber lens cap which can be a little fiddly to press on and off, but at least it’s all supplied. I compared the AF of the Leica 15mm against the Olympus 17mm on both Panasonic and Olympus bodies. Mounted on a Lumix GM1, the Lecia 15mm felt a tad swifter at focusing than the Olympus, but there wasn’t much in it. Mounted on an Olympus OMD EM1, I noticed the opposite with the 17mm focusing fractionally faster than the Leica. But the difference between each lens on either body was minimal – both focused quickly. In terms of AF noise, the Leica 15mm was fractionally louder than the Olympus 17mm, but with a lower pitch which evened them out. But again to hear any difference you’d need to either be recording video or holding the cameras to your ears in a silent room – they’re both pretty quiet. Moving onto manual focusing, the Leica has a very smooth manual focusing ring and a handy switch on the side of the barrel to switch between AF and MF, so you don’t need to go through any menus on the camera. The Olympus 17mm also has a manual focusing ring, although sporting a unique pull-back mechanism which switches it between AF and MF. When pulled back, the Olympus also reveals focus distance markings and depth of field indicators which can be useful, especially as the lens will also ‘remember’ its manual focusing distance even when the camera is powered-off or asleep, whereas most Micro Four Thirds lenses reset to infinity at a power refresh. The focusing rings on both lenses were smooth, but the Leica felt stiffer – perhaps as a newer sample. 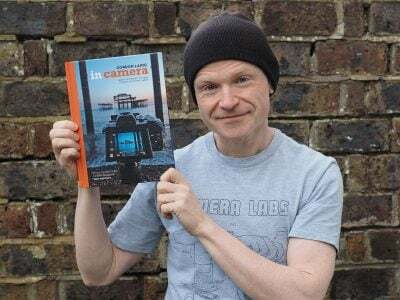 Ultimately I preferred manual focusing with the Olympus thanks to the pull-back mechanism and looser ring, but I certainly don’t have any complaints regarding the Leica in this regard – it offers a very satisfactory manual focusing experience. The Leica 15mm may not offer focusing distance markings, but it does have a manual aperture ring positioned near the front of the barrel. 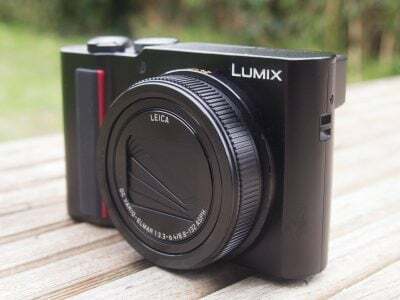 When mounted on a Panasonic Lumix G body, this lets you dial-in the desired aperture from f1.7 to f16 (in one third increments from f2 onwards) in Aperture Priority or Manual modes. There’s also an A position on the dial, which would normally be required for automatic selection of aperture by the camera body, but when mounted on my GM1 in Program or Shutter Priority, the camera was happy to ignore the position of the dial and just set it itself regardless. Mount the lens on an Olympus body and the aperture ring is ignored, at least at the time of writing. Again when on my OMD EM1, the camera ignored the aperture ring position and just set it automatically or using the body’s control dial. Now it’s time to check out how the lens performs in practice! Check out my Leica 15mm f1.7 sharpness and Leica 15mm f1.7 depth of field results! Or skip to my Leica 15mm f1.7 sample images or straight to my verdict!